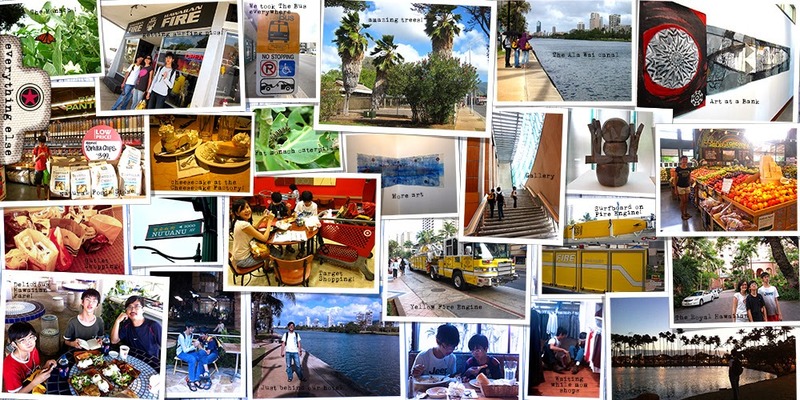 But today I want to share how we record and scrapbook our travels. I am excited to share how this has changed for us over the years. The format may have evolved, but the aim of capturing memories, images, moments is the same. And all of them equally wonderful and precious. I dug into our boxes and found that we have these many journals, kept from our trips over the years! Each of these are precious records of each of our journeys. We take our trips seriously, planning months ahead, researching and finding deals, Reading guidebooks, detailing our daily plans in these journals before we set off. While on the trip, we journal daily, also in the same notebook., usually lined, ring bound, not too heavy or bulky, as it will travel with us. We usually take turns to write in it, every chance we get, while we are in the train, at meals, waiting for the bus. We capture where we went, what we saw and did, and also how we felt, thoughts and jokes shared, anything that impressed, surprised, awed us. We even get illustrations (courtesy of Jared), record our spending, and get 'stamps' into these books. Once we had children, the trips took on different focus. The early years we only traveled to nearby locations, mainly beach locations, and visiting playgrounds was the highlight! But this is something I love a lot: Once the children could read and write, we got them to do the journaling on the trips! Se the pages below, we were in Phuket, Thailand, I got them to journal on note papers while on the trip, then I cut and paste these in our journal books when we got home. It's really in their own words, spelling mistakes and all, seeing things from their eyes and totally cute. These are our most precious journals. If you have children this age, try it! P.S. I can't get them to do it now if I tried, lol! Or get them to draw! In this next trip album, you can see that Ryan's (who was probably eight) writing, while Jared (six) did most of his 'journaling' by drawing instead! This was us in Perth, Australia. You can see Jared's drawings depicting Penguin Island, the Tree-Top Walk, and Rottnest Island. How precious is that? I think then we just had our first digital cameras, and I home-printed the pictures and pasted them in large paper scrapbooks from the bookstore. In 2005, I had discovered digital scrapbooking and photoshop 5. It was early days yet, and I did not have much digital scrapbook supplies as we know it today. For our trip to New Zealand, I did my own 'layouts' in 8.5x11 'A4' pages, and printed them out on our home printer, and slot them into a regular clear folder file. From here on I designed all our travels into digital scrapbook pages, transferring journaling from our notebooks onto the pages. 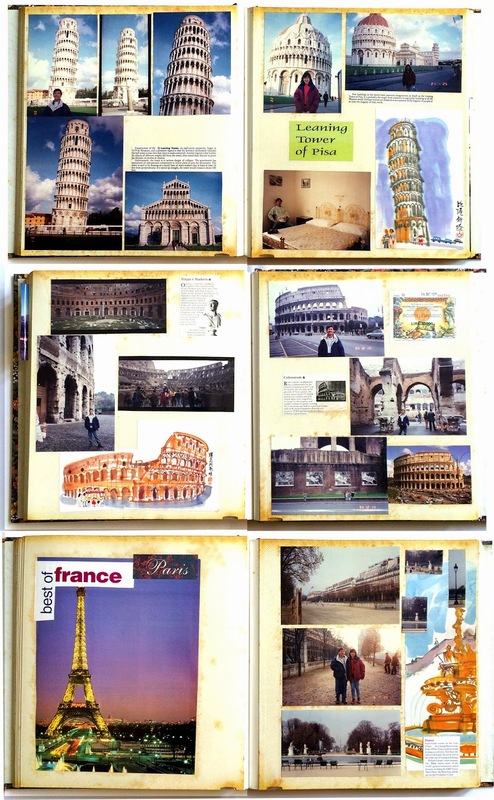 Hope it was fun to see my older scrapbooks and journals, and that it provided an idea or two! And now we come back to my latest pages, which are the last 5 layouts for our Hawaii trip! At Hanauma Bay, where we spotted an Octopus while snorkelling and followed it for 15 minutes, totally amazing and magical! First time ever in our lives! 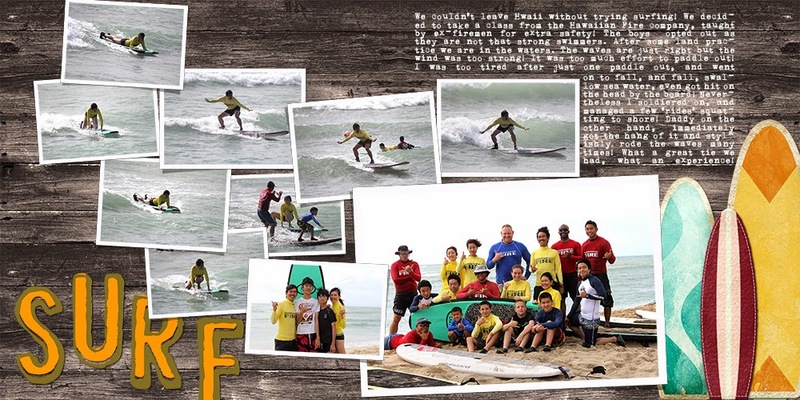 Taking a surfing class, what an experience for us, probably once in a lifetime! Just enjoying our last evening in the beautiful Hawaii..
And having fun in the hotel room. Yes, even this deserves a double page layout in my album, haha, I just love these moments and it shows what a wonderful time we have as a family, how good it is to have the boys with us on these trips and just hang out and just have fun and make memories. And a final double page to capture all the miscellaneous pictures that makes up or even sums up the trip. I only had space on the left to insert a tab and call it 'everything else'. Love the completely smothered page! If you also like it as much as me, download it Here to play with! Your journal evolution looks similar to mine. I started when I was still a girl with journals with some ephemera glued in. Then it was photo albums and a few descriptions (plus journals as an extra book). 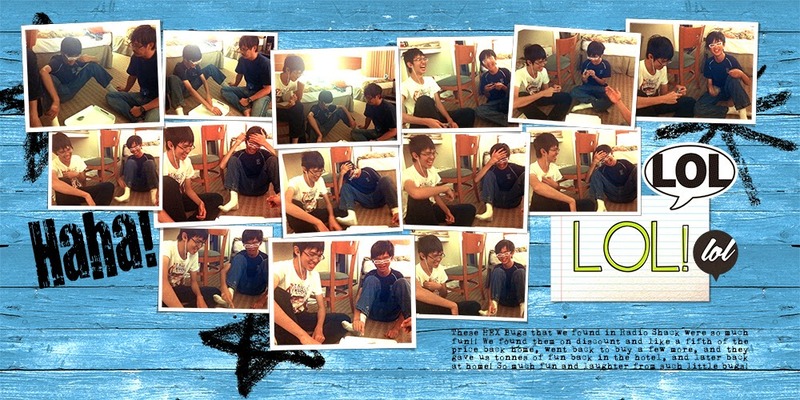 Now it's scrapbook pages in photobooks. Thank you for the template freebie. Most of us have been memory keepers for life. It is just how we record or scrapbook that has changed. Wonderful to look back and find those earlier books just as precious if less 'professional looking'! Thanks so much for the template! 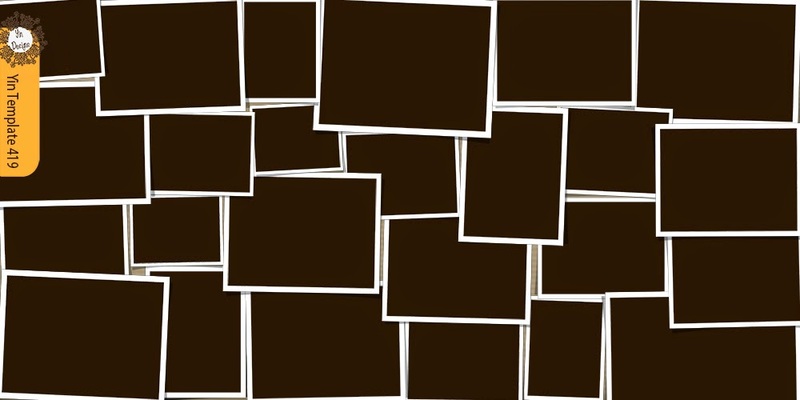 I really enjoy seeing your layouts, especially of your trips. It was interesting to see how they have evolved over the years. Loved seeing all of those lovingly written journals that you have saved over the years. They are great memories with or without the photos. Thank you for this template! 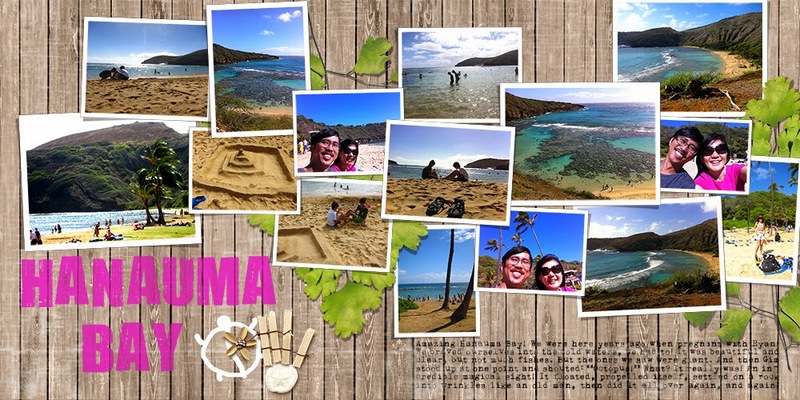 I always have extra vacation pictures and this template will be perfect for including those pics in my album. Thanks again! Thank you so much for the fun template! Thank you so much for the template. Appreciated. I enjoyed reading about your travel journey. As always I loved the pictures and the templates. THANK YOU!!! 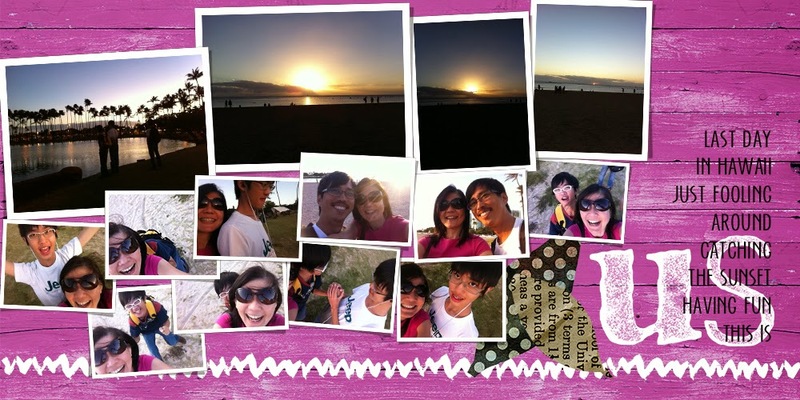 Love all your templates and seeing how you record your memories was great! I'm going to have the kids start writing a few things now! Thank you so much for sharing! I just love your templates! The majority of templates I use happen to be yours! Thank you so much! Your templates are so fun to use!